When my career hit what appeared to be a dead-end, I decided to take a sabbatical to re-evaluate what I wanted to do with my life. I went to Thailand where I completed my Rescue Diver, Divemaster and Open Water Instructor courses. I saw loads of turtles and sharks and manta rays and other cool marine creatures. I met an Italian who I followed to Italy which is where I first discovered and walked a section of the Via Francigena. When I finished, with tendonitis in my feet and two badly bruised toe nails that fell off months later, I knew I wanted to walk the whole trail one day. And that time is now. So I am about to embark on a 2,000 killometre partly because of that small hawksbill turtle that called me to wake up and see a different world than the city, work-focussed, indoor life I had been living. My travels and my diving have opened my eyes up not only to the beauty and wonder of this world but to the perils it now faces. By spending so much time in the sea I have seen the direct and negative impact humans are having; oil spills, fishing nets, rubbish, so much rubbish and the impact of over-fishing, cyanide and dynamite fishing on reefs and fish population. 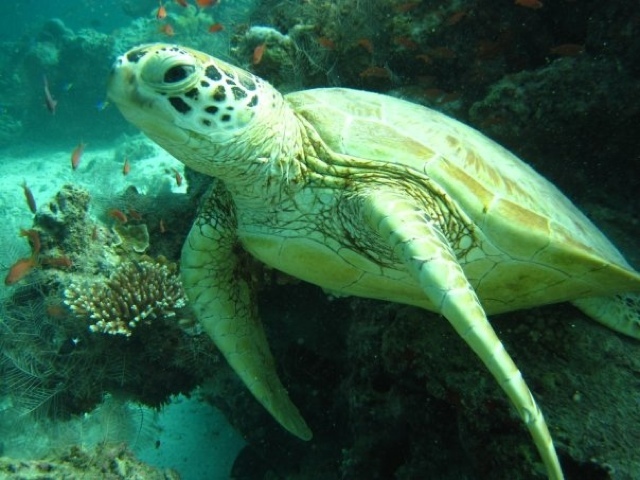 Nearly all species of sea turtles are endangered. Humans have over exploited them, slaughtering them for their meat, skin, shells and eggs. We have destroyed their habitat. We catch them in our fishing nets. They eat the rubbish we carelessly discard into our seas and they die slow and painful deaths. The change in our climate is resulting in fewer male hatchlings so there are less males to breed. We want to turn away from what is happening because its too horrible and heart-breaking to believe and the problem is so big we don't know what we can to do to help solve it. But we have to try. In gratitude of that one small turtle that opened my eyes to the wonders of our ocean and our world and lead me on this journey in the first place, I want to give something back. 1. Dispose of your rubbish thoughtfully. Our seas really are swimming with plastic bags and bottles amongst other things. 2. Say no to plastic bags. Use reusable shopping bags. Keep a reusable one in the car. If it’s only a few items carry them or stuff them in your handbag or go home and get your reusable bag. 3. Say no to plastic bottles. Carry a BPA-free reusable bottle with you. Better for your health and better for the environment. 5. To help the environment in general, become a conscious consumer. Ask yourself where does it come from? How was it made? What is in it? Do I really need it? And of course you can support me by cheering me on; leave comments on my blog or send me emails or messages via Facebook. I will walk alone but no journey is really undertaken alone. Your support will be the river that carries me on.